Blogger Template - Infinite Template is one of the best templates created by Arlina Design / Idntheme. 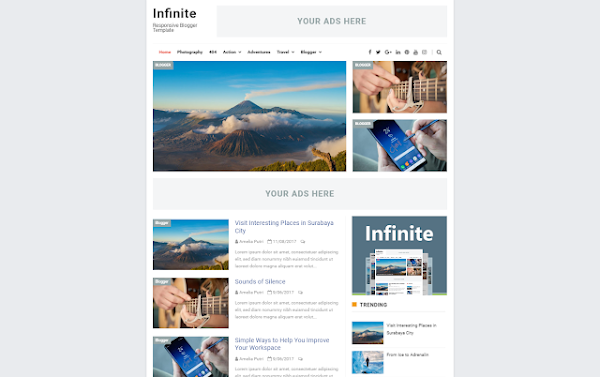 This Infinite Blogger template itself has a very modern look and is also equipped with a very responsive social media icon. Apart from that there are also the best features like premium display (3-Slide) which is very cool for your blog. In the post view, this template is also given some very unique features such as in the top / top there is 1 place where the ads are ready, Image responsive, responsive Demo & Download button, and in the carrying section there is a very cool social share "jalantikus & certainly subscribe button, Oh, the comment used is the comment disqus, if you don't like this comment, you can replace it to the default blogger. This Infinite Template has a minimalist, simple display design and of course has very Premium features. Responsiveness in this template is arguably very perfect. It can be said that it is very optimal for this one template. They designed this template with several meta tags for the optimization. For more info on the n-Optimization problem you can find this document using the Documentation. If you want to be clearer about how this Infinite Premium Blogger template looks and also if you want to have this template, the following demo and download link. To remove the copyright of this template, please buy it at Arlina Design for the delevoper license.